A good 11mm large 6 shot double action pin-fire revolver with embossed Lion grips. Ref1608. 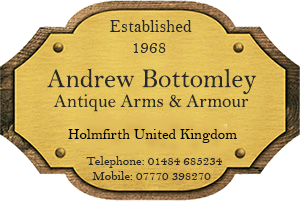 Welcome to Andrew Bottomley.com - Antique weapons for sale, Arms & Armour, Collectors swords & Firearms. IN STOCK NOW AND FOR SALE ON THIS WEBSITE. Original Antique Weaponry and associated items for sale, including Nautical items, Percussion pistols, Flintlock pistols, Cased pairs of Antique pistols, American Revolvers, Rim-fire pistols, Bowie Knives, Scottish Dirks, Basket Hilt Swords, Naval Dirks, Hunting swords, & Firearms-curiosa, from all eras, including Medieval items, The English Civil War, The Crimean war, Napoleonic era, American Civil war, American Revolutionary War, WWI & WWII. Every item for sale is guaranteed to be original and to be of the period stated. No Licence is required to purchase genuine Antique weapons in the United Kingdom however you must be over 18 years of age to place an order with us. We have been established in the antique weapons business since 1968, previously selling antique weapons to worldwide clients, through our long established illustrated mail-order catalogues. We are now using modern technology to bring our goods directly to you. We hope that you like it and that you will find something of interest. We carry in stock the largest selection of genuine antique weapons for sale in Great Britain. We have exported antique weapons to 34 different countries. We do already have more antique weapons to add to this website, so please come back and visit again soon. To use the search facility on our website please go to our home page and put your text into the search box. This will assist you to find the item that you are looking for. You can always telephone us for assistance in using this website. A selection of some of our items available for sale can now be viewed on the following pages. Please remember that these items are original antiques and before placing an order you should expect there to be some degree of age showing. Genuine antiques are rarely in perfect condition and will often have minor wear and blemishes which are all part of their history, so please keep this in mind and if you are looking for something in brand new condition then antiques are probably not for you. Our descriptions are honest and reliable and we try very hard to describe items fully. Should you be interested in any item, please simply give us a call and we will be only too happy to go through the item in detail with you on the telephone. You can order with complete confidence as customer satisfaction is very important to us. Once you buy from us, you will hopefully be back for more. Any customer buying goods directly from our website by mail has a right to cancel their sales contract within 14 days. Any goods returned must be in the same condition as when we sent it out. You may not place an order on this website if you are under 18 years of age or you are a person who is prohibited from owning an antique gun for any reason.